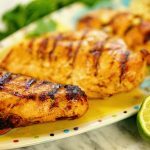 The BEST Grilled Chili Lime Chicken starts with a ridiculously simple chili lime marinade. This is a wonderfully simple recipe that your whole family will request over and over again! 6 chicken breasts breasts or thighs, use your favorite cut of meat! Measure the olive oil and add it to a measuring cup or small bowl. Juice and zest the limes - add them to the bowl. Mince the garlic and cilantro. Measure the spices and add everything to the bowl. Whisk everything together well. Pour into a ziplock bag. Add the chicken. Massage all the spices into the chicken. Allow to set for 30 minutes. Do not refrigerate, this way the meat will come to room temperature and be better for grilling! Now it's time to grill! Remove from the marinade, heat your grill and grill the chicken until the internal temperature reachers 165 degrees. Cover and allow to rest for 30 minutes. Enjoy!